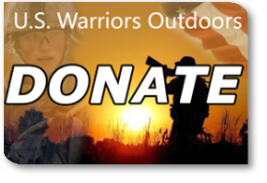 U.S. Warriors Outdoors, a tax-exempt 501(C)3 nonprofit organization, was created to enable Wounded Warrior Veterans, opportunities to get back to the outdoors and provide these Men and Women reconnections with their hunting dreams and passions. We provide full financial support, logistics, accommodations, guiding and support resources to bring our wounded heroes on hunts for elk, whitetail deer, turkeys, coyote’s, upland game birds and waterfowl. This is our humble way of saying thanks to our Wounded Warriors for their selfless dedication, sacrifices and honor so we may all live in a free America. U.S. Warriors Outdoors mission is to help Wounded Warriors build hope, confidence and family strength through quality outdoor adventures. "Last weekend’s hunting event with U.S. Warriors Outdoors brought together my passion for hunting and my respect and admiration for those who have served our country in the armed services. USWO provides a therapeutic, safe and fun outdoor experience for our veteran heroes in quality environments." Former linebacker for the Denver Broncos and 5-time Pro Bowler.